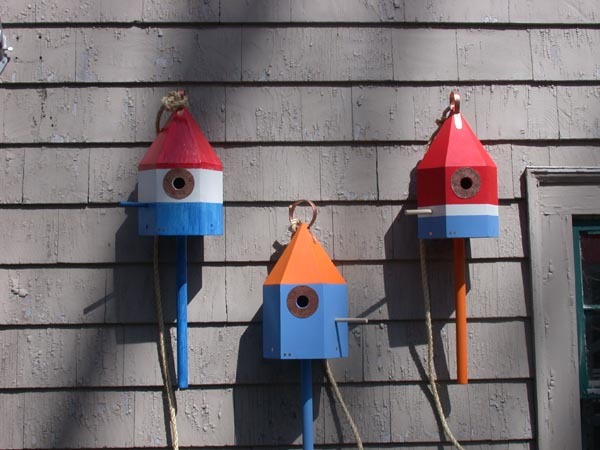 Hand made lobster buoy bird houses, ideal for House Wrens and Chickadees. The portal hole is protected with a hand wrought copper plate, to keep out the pesky squirrels, woodpeckers and other less desirable birds. Easy cleaning with the removal of three brass screws. Each box is numbered and signed. Hang from the copper loop on top or wall mount from 5 to 15 feet high. Inside wire ladder to aid baby birds in leaving box.